3:22 I'm done. Thanks for coming. See you next week. Take a course. Learn to Cash In On Chaos. 9:45 That FOG pattern is the reason I got long quickly. FOG patterns help you find energy centers. These centers are chaotic Strange attractors, which become strange repellors at the energy center. and Venus near 1300 Eastern. This can be seen on the SPSunMoonMer chart. energy for a rally on Tuesday. Since then the market had pulled back in a converging triangle, which may be ending. So today looks modestly bullish. 9:17 on the AUX page I have put up a daily chart to show some context. The market has rallied since February , testing the highs near 2100. It is currently in a congestion. 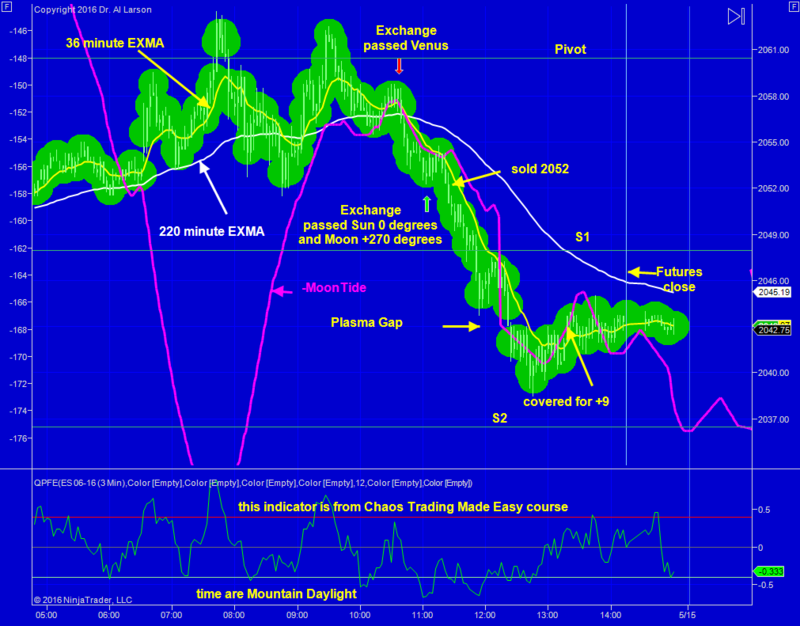 The EXMAs are showing a continuation buy set up. So to me it looks like we could see a retest and possible break of 2100 over the next week or so. The next Essentials of Personal and Market Astrophysics will be taught June 22-24. If you want to come, send Al An Email. 5/13/2016 1:26:55 PM MT TG****:: Hi BBB, how's it going. 5/13/2016 12:31:13 PM MT bbb****:: Nice Job TG. I have had terrible connection problems today. Throwing a question and a chart in the CCT room Al, would love your take. 5/13/2016 12:30:37 PM MT JSF:: Do you expect a reversal at 14:50? 5/13/2016 11:52:17 AM MT TG****:: Now it did. Wish I had held tight a little longer but I carried bad inventory into the position reversal and took on a bigger position with the short so I decided to take a profit for the day in case this held the overnight low. 5/13/2016 11:49:38 AM MT TG****:: New lower low for move 7 down in regular trading hours but this drop hasn't taken out the overnight low yet. 5/13/2016 11:48:25 AM MT TG****:: This was a tough one. I reversed my position at my 54 stop and made my loss back and a few more. 5/13/2016 9:18:50 AM MT TG****:: 18 minute bars work nicely on the 24 Hr chart and anyone could see that CC that started late during regular trading hours on 5/10. Usually the fractal will show a completion during regular trading hours but not always. 5/13/2016 9:13:10 AM MT TG****:: If I look at the same fractal on the 24 Hr chart it looks like 7 completed overnight to a new low. 5/13/2016 8:43:46 AM MT TG****:: I have a 3 day fractal trying to complete. 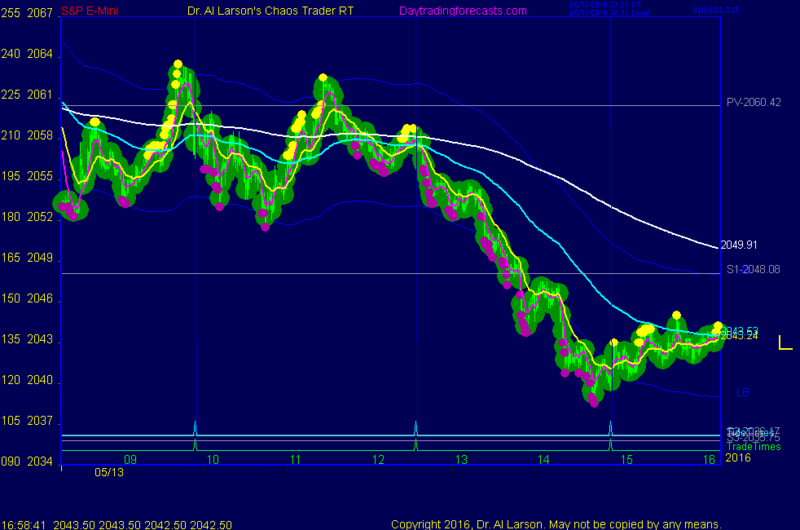 Looks like it should make a final lower low unless move 7 is truncated. 5/13/2016 8:21:40 AM MT infokid:: What is the target? 5/13/2016 7:51:14 AM MT TG****:: GM everyone. 5/13/2016 7:27:38 AM MT infokid:: Good Morning All. Good luck everyone. 5/13/2016 6:18:22 AM MT mm****:: gm all - have a great day !